SOLD! Call Today if you'd like to Sell! ANOTHER HOME SOLD! Welcome home to this beautiful 5 bedroom, 4.5 bath home with over 3800 square feet, a fenced-in yard, and the master suite on the main level! As you enter you'll love the hardwood floors that flow throughout the entire first level and the stairs. 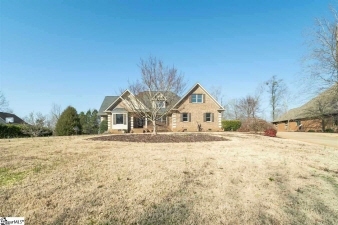 The floor plan is well laid out and offers plenty of space with a main level office, a formal dining room, a butler's pantry, and a great room with built-ins, recessed lighting, and a floor to ceiling brick fireplace. The kitchen features its own breakfast area that walks out to your deck. The main level owner's suite offers a walk-in closet, full bath with dual vanities, separate shower and garden tub, and a second private deck. You also have a large laundry room on the main level with sink and lots of counters and cabinets. Upstairs you'll find four spacious bedrooms with two having their own full bathroom, and a jack and jill bath shared by the other two, plus a large loft area. Too many other features to list - see this home today!